The problem with stagnant wages is our socioeconomic system requires ever-higher incomes to function. Why have wages for the bottom 95% lost ground in an expanding economy? 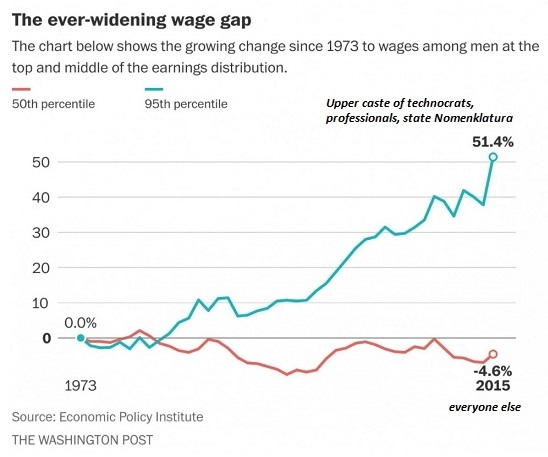 We can start our search for answers by looking at a chart of wages going back 44 years to the early 1970s. 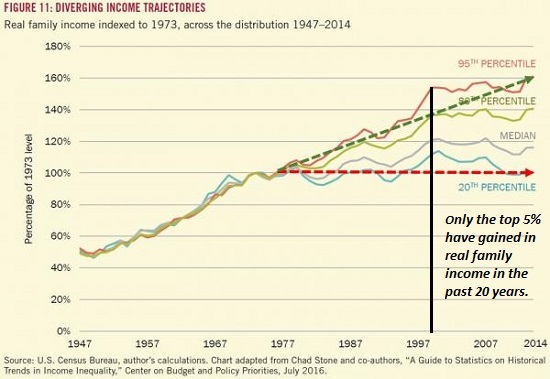 Note that the top 5% began pulling away in the 1980s, when financialization and globalization took off and accelerated in the 1990s tech boom and the early 2000s housing bubble. The bottom 95% benefited from these booms, but at a much more modest level: wages for the bottom 95% almost returned to 0% gain as opposed to actual declines. The forces that gathered steam in the 1970s, 80s, and 90s that pressured wages are well-known: financialization, which benefited the top echelons at the expense of the increasingly burdened debt-serfs; globalization, which pitted American workers against an ever-expanding global work force of low-paid employees, and automation/software, which expanded from the factory floor into service sectors. Those workers with the skills required by financialization, globalization and automation—the technocrat and managerial classes—benefited mightily, while those who could not add enough value at the top of the chain saw their wages stagnate. 2. Revenue that could have gone to wages has been siphoned off by soaring labor overhead: healthcare premiums, higher workers compensation taxes, etc. When an employer has to pay $500 more per month for an employee's healthcare insurance premium, that's $500 that could have gone into a fatter paycheck; instead, it disappeared into the insatiable maw of US healthcare. Check out Is the US Economy Doing Just Fine? The problem with stagnant wages is our socioeconomic system requires ever-higher incomes to function. Stagnant wages kill pay-as-you-go social programs such as Medicare, local governments dependent on income taxes, and of course the consumer sectors that rely on the spending of the bottom 95%. As I have noted many times, filling the gap between stagnant wages and higher expenses with more debt works for a while, but it isn't a permanent solution, as eventually the costs of servicing the higher debt eats the borrower alive—and when he defaults, the bad debt eats the lender alive, too.